Footage found on the phone of a Palestinian man captured by the LNA, who was reportedly amongst BDB forces, depicts the Palestinian and his companions chanting an ISIS song as well as the execution of LNA soldiers. On 18 May, forces affiliated with the GNA conducted an attack on Brak al-Shatti airbase controlled by LNA in south-west Libya, leaving 74 LNA fighters dead and ending the ‘ceasefire’ between the opposing forces. The GNA is in disarray following the attack with differing statements and a pending investigation in the incident. On 17 October, Libyan military unification talks resumed in Cairo. The discussions, mediated by Egypt, ended with no formal declaration, resolutions or agreements. On 19 October, the LNA launched Operation “Hawd Murzuq” in an attempt to remove rebel armed groups from southern Libya. On 24 May, a VBIED attack occurred in Benghazi killing at least six people and wounded 22 others. The motives and the perpetrators remain unknown. On 25 May, the commander of the LNA’s 21 Saiqa Brigade claimed to have survived an assassination attempt in Benghazi. On 28 May, the LNA Air force claim to have struck multiple “Chadian militias” in southern Libya. On 4 November, an LNA security post on the road between Jufra and Brak al-Shatti in south-west Libya was attacked by unknown assailants, killing two people. Reports that ISIS fighters still present on the coast east of Sirte. Saiqa initially rejected the ICC arrest warrant issued for al-Warfalli on 15 August, but now reports that he is suspended pending investigation. A delegation from Derna led by the head of the Derna municipal council met with Serraj on 15 August to discuss the on going siege on the city. 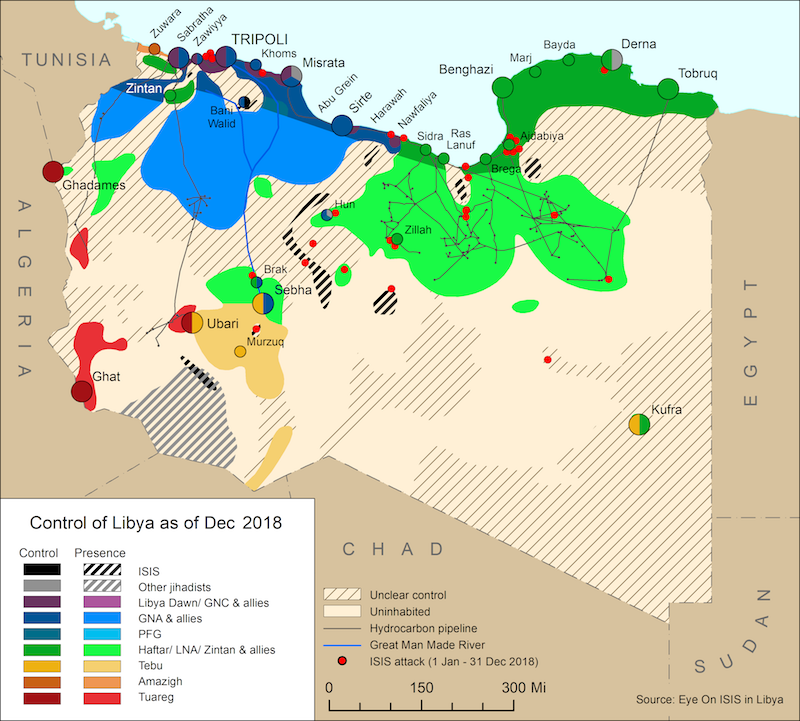 On 16 August, internal clashes broke out between Libyan National Army’s (LNA) Omar al-Mukhtar Operations Room over control at the Martuba checkpoint which controls entry into Derna. The LNA took the Jufra airbase from the GNA-aligned BDB last week, pushing the BDB north towards Sirte. 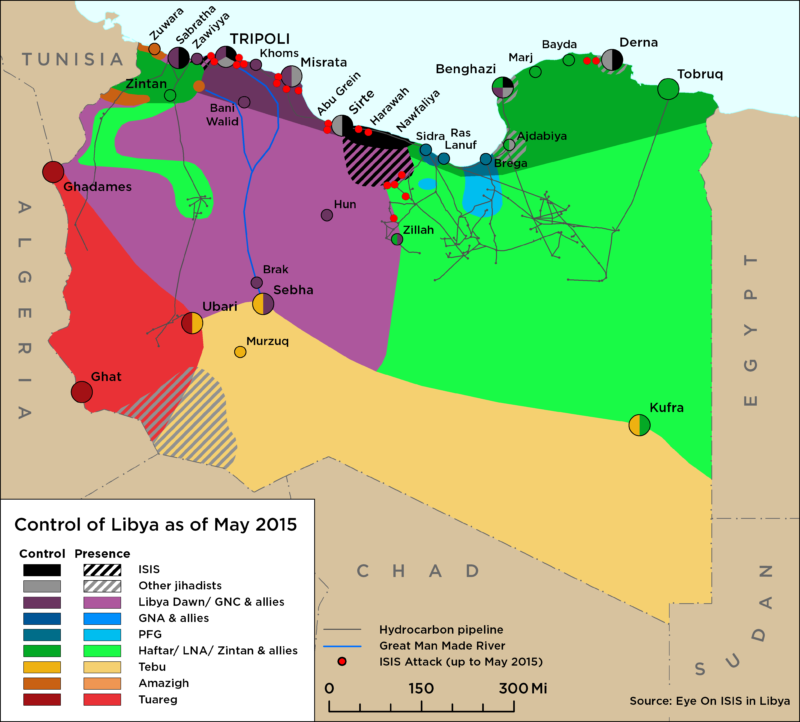 The GNA issued decisions dividing Libya into 7 military zones, igniting protests in eastern Libya. On 26 May, pro-GNA Tripoli militias evicted rival anti-GNA militias from the capital, taking over key sites including Hadba prison. 52 people were killed in the fighting. The LNA recognised the pro-GNA militias’ efforts against ‘Islamist terrorists’. GNA prime minister Fayez al-Serraj met briefly with US President Donald in Riyadh, Saudi Arabia during the American Islamic States Summit. China, Russia, France, the UK and the USA condemn violence in Libya following the Brak attack. Kobler warns that summary executions are included under war crimes and may be prosecuted by the ICC. Several videos released this week appear to indicate links between the BDB and jihadist groups in Brak al-Shatti. The LNA retook Souq al-Arab in downtown Sabri on 18 May, while Werfalli released another execution video.